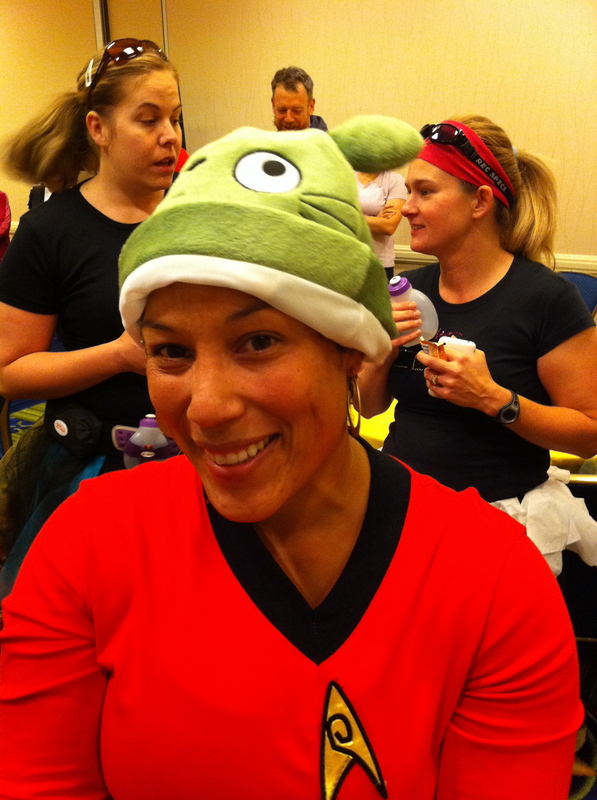 The NeverEnding Story: Fitbloggin’ Part 2! So after the fitness fun, we had lunch. WOW the food was amazing at this conference! Not the usual icky hotel fare. It was GOOD. Lots of fresh veggies, and grilled sandwiches, and interesting salads… other people have detailed the food better than me, with lovely photos, so check that out. After lunch I started feeling insane from sweat and grunge (I had not showered since leaving California – UGH!) and also jittery tired and starting to get anxious for the evening performance. I ran upstairs to take a shower and since I did that, I missed the Laughing Cow blogger & brand panel. Wahhh. It just isn’t possible to do everything! Then it was time for the Blogging: from Hobby to Career panel. During that one, Paolo and I were getting some very very necessary shut-eye so we could refuel for the evening. Zzzzzz. I was very sorry to miss Carla & company on that one until the final 15 minutes or so. By then it was 5pm and it was time to get serious about prepping for the show. I have to say, performing in a venue like this is very very different from performing at a little theater at home. Usually, what I do at home is not plan anything else for the day (hahahahahaha!). Then we get to the theater a couple hours early to go over our tech cues, walk through our lines, meditate, pace, or huddle in a corner. We don’t talk to anyone and they don’t talk to us. To be prepping for a performance on the same day as a 5k run (in which I got up the equivalent of 3am), several other fitness events and hundreds of people milling around that I wanted to talk to, was brain-melting to say the least. Paolo and I instructed the hotel guys in re-arranging the stage platform riser, and they listened to us (mostly him) run through the piece a few times. The guys LOVED listening to Paolo and kept cracking up while they were breaking down the huge screen and moving chairs around. But I was aware of the cocktail mixer in the room next door, and hoping that people would drift in… drift over… and a few did, and a few more, but definitely nowhere near the 250 people in attendance at Fitbloggin’. We started fretting. We started begging our friends who were in the audience to go next door and make an announcement. Which they did. I think I hadn’t realized until this moment how BIG it was for me to do this particular performance in this particular venue. I had performed it many times in San Francisco, but that was for general audiences who may or may not care about fitness or health. But this audience… this audience was the reason I HAD a blog, which was the reason I had a show. I know my big raw heart was super out there that night, and every time I saw a little group of people walking PAST the open doors, it just broke a little. But you know what? We killed it. I think we both brought our best up there and I know it was good for the people who were there. It was a really huge and emotional thing for me. I was so glad Paolo was there, to be my performing buddy, to ROCK his brand new show “I Get Wet” and to really understand what all of it meant. After the show we were sprinkled with wonderful Tweets and it all felt good. I went out to dinner with my terrific roommates, and then collapsed big-time. In retrospect, it was understandable, that more people didn’t come. People were starving and exhausted. A lot of people didn’t even realize it was happening. (one friend said, I can’t wait to see your show tomorrow night! later at the bar) Most people hadn’t gone up to their room for a nap in the afternoon like I had. I had to miss some stuff because of my own personal situation, and the same was true for others during the 8pm hour. If we ever come back for a repeat Fitbloggin’ performance (and I hope we do), I think I’d propose that we get scheduled earlier in the day OR that there are provisions for food during the show (after all, it was all set up a la dinner theater). Some resourceful people went out to Whole Foods and brought their dinners back to eat during the show, and that was cool, but most people just had no idea to do that. For anyone who’s reading this who didn’t come to the show that night, I don’t mean this to be all guilt trippy, I really don’t! I love you and I understand that Life just happened that night, whether it was “I need to do something else” or “PF Chang’s held us hostage with poisoned chopsticks” or “I fell asleep.” (I totally get that!!) I hope that we will have more opportunities to perform for this wonderful community in the future. And I want to thank Katy Widrick for this tearjerking (for me) awesome review!! It was a night that I almost skipped — I’d had one of the busiest days of my life, running around the Fitbloggin’ conference –But when I saw that Susan Ito and Paolo Sambrano were scheduled to perform their one-woman and one-man shows, I decided to peek in and see what it was all about.One hour and two standing ovations later, my face was streaked with tears, my stomach hurt from laughing and I was so glad I’d attended the shows. Susan Ito’s performance struck at my very center — from the first line, in which she finds herself facing a devastating health journey, to the very end, her emotional yet entertaining story inspired and touched me. Her ability to tell a story, with no props and just a small stage, made me forget where I was. People of all ages, backgrounds and experiences will sympathize with Susan’s challenges while cheering her on through the defeats and the successes. Paolo Sambrano has an incredible ability to transform his body and face to tell a painful yet wildly funny story — and as he shared his history of overeating, ripe with family pressure and cultural challenges, I found myself laughing hysterically while fighting back tears. From the showdown at the fast food joint to a shudder-inducing story of his family’s travels, Paolo takes what could be a sad and depressing journey through obesity and weight loss and turns it into just a well-told experience. 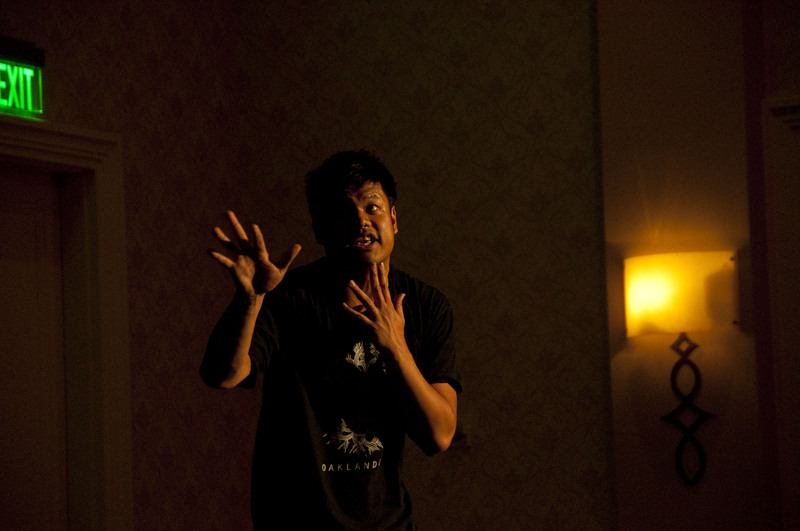 I can’t recommend Susan and Paolo’s shows highly enough — two thumbs up, five stars and roaring ovations for both. Just one amazing review like that makes it all. Worth it. 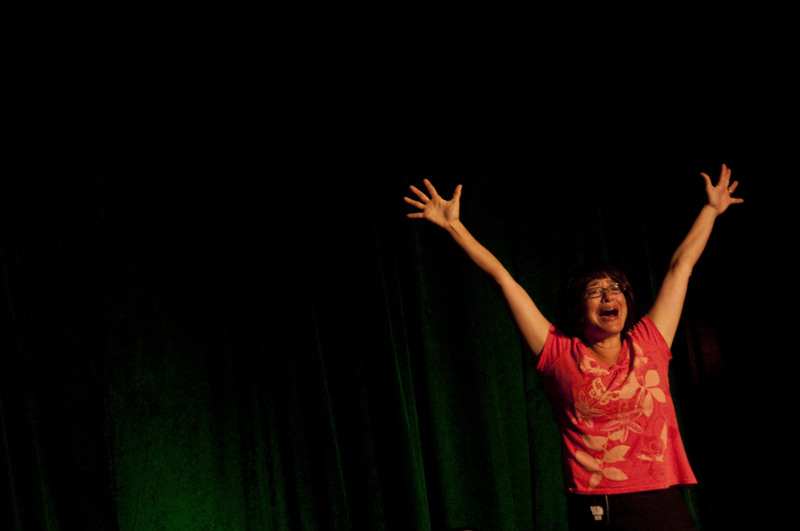 I’ve been putting off writing this mega-recap of Fitbloggin‘ because I know it’s going to take hours and hours. It was such a HUGE experience and I’ve been having difficulty processing it all in my head. I know I’m not the only one. It was an incredible event and I’ve been contemplating- do I tell it chronologically? (like my race recaps, from beginning to end) or topically, thematically? I think what I’m going to do is write it chronologically, but then I’m going to have to write separate blog posts for big themes that come up. Sigh. This could take a long time. Bear with me, people! 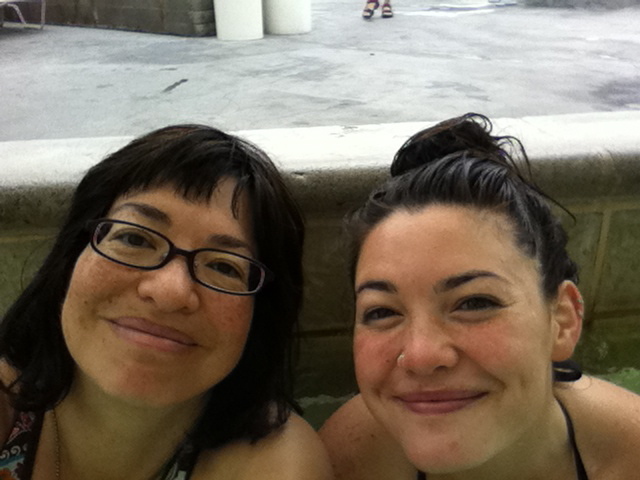 At the baggage claim, we met up with Mara of Medicinal Marzipan and the party began! 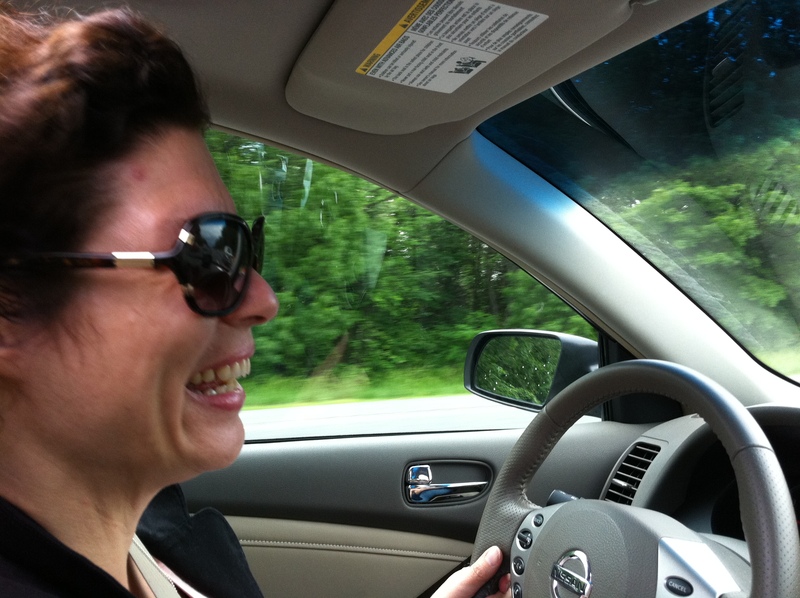 My roommate Karen was on her way to pick me up and we all got in the car together. Good times! Happy Times! 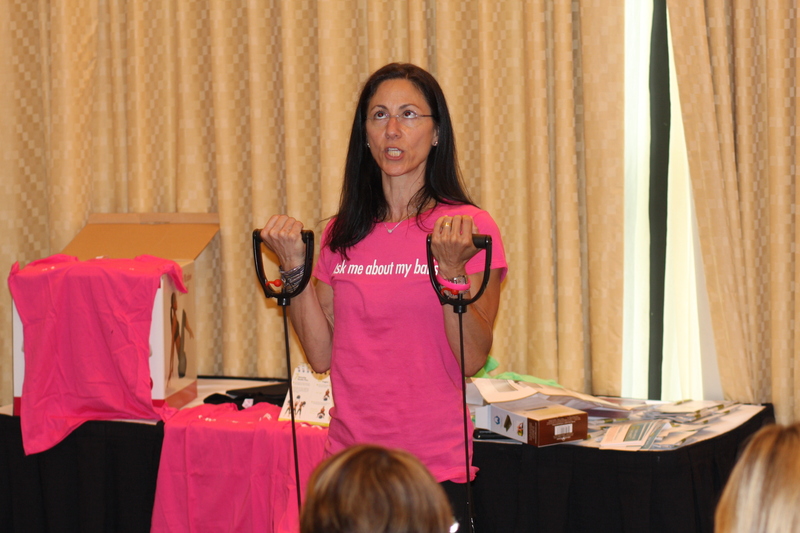 Karen, our lovely personal Fitbloggin' driver! Got to the Marriott. Wow, Baltimore is pretty. I hadn’t realized that during my last work trip in February. It’s totally cool! 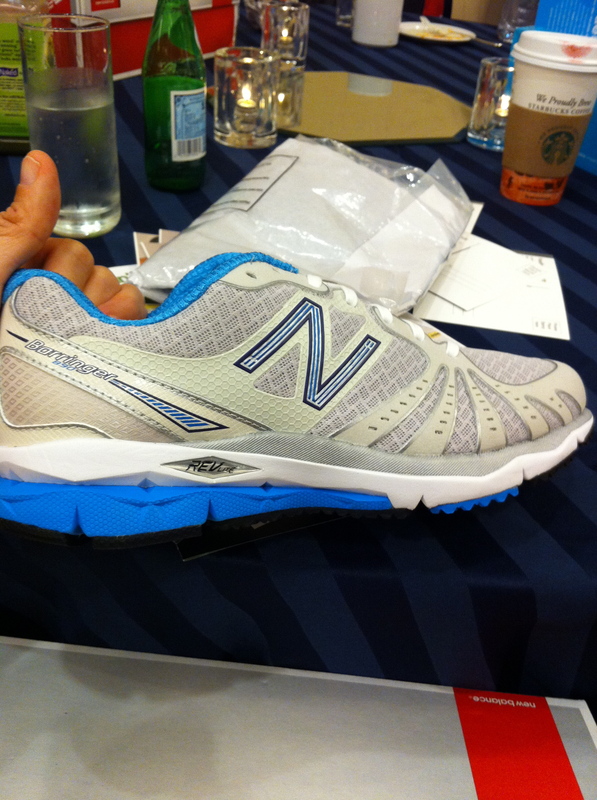 We checked-in to the Fitbloggin desk and got our GINORMOUS bags of swag which included New Balance running shoes (whaaat? ), cute beanie caps with MP3 speakers at the ears, and a pile of other stuff. Also the coolest name badges ever which we got to decorate ourselves. Yay! I heart stickers! The opening social was kind of a whirlwind chaos of meeting people for the first time, eating yummy snacks, hugging (yeah I wore my Free Hugs shirt), jumping on trampolines, poking people with our Pokens (coolest little gizmo ever – you stick your little hand next to their little hand and when the palms turn green, voila! your contact info has been exchanged!) and just brain-exploding WOW WE ARE HERE! 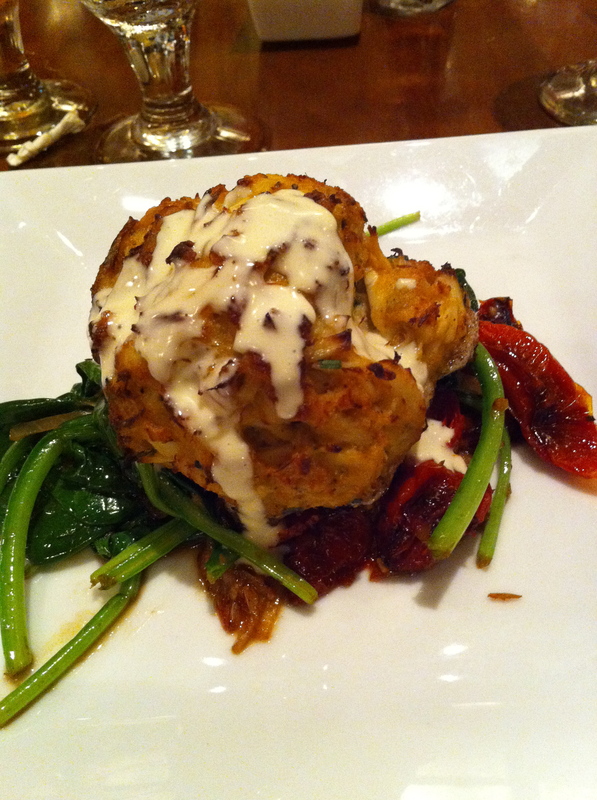 Friday night I had one of the awesomest crabcakes ever, at dinner with my roommates in the hotel restaurant. YUMMY! Friday morning I woke up at 6am, to get ready for the 7am 5k. Mind you, this was 3am California time, and I’d gotten up at 2am California time to catch my flight the day before. I was running on pure adrenaline fumes! 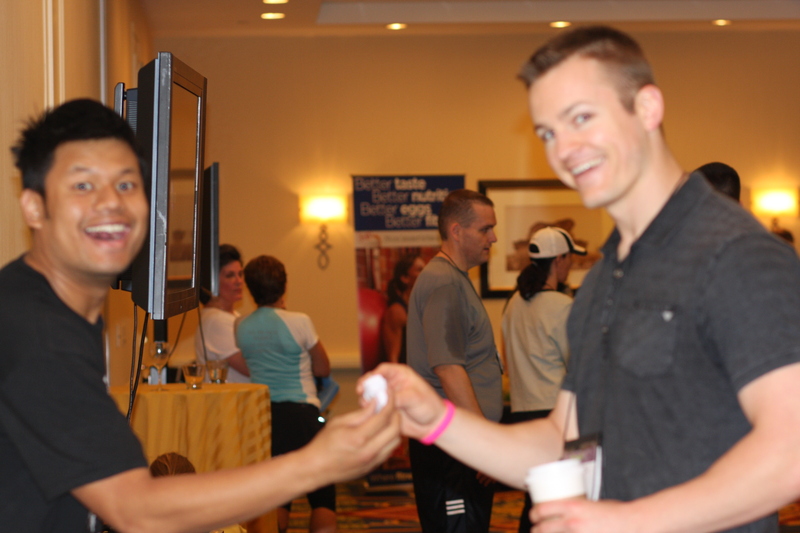 As other people have pointed out, Fitbloggin’ is not the most racially diverse event one could find. Which was why Jess and I were so excited to be Asian buddies together. Without her, it was lookin’ like just me and @Paolo. Did this matter? Not reallllllllllllly. But at the same time, there’s a certain comfort in not feeling like the only One of something. A lot of people were not quite sure what to make of my Totoro hat. 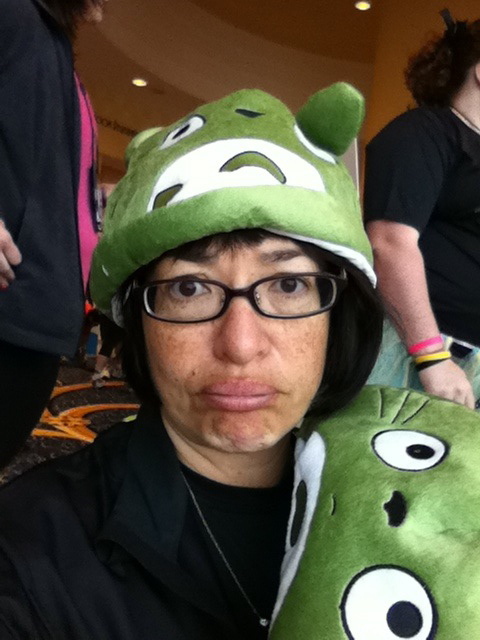 One person Tweeted that I was wearing a “manga cat” hat. Hahaha! NOT a cat. Then Kia (aka @bodhi_bear) went wild went she saw it! TOTOROOOOOOOOOOOOOOO!!!!!!!!!!! and I knew she was the one who had to have the twin hat. The 5k commenced out back of the hotel. It was allegedly a run-walk thing, but I could immediately feel the SPEED in the front-runners and I knew people were going much faster than my norm. It’s hard for me especially in smaller race crowds to “find my own pace” and not want to keep up with everyone else. It takes a lot to FOCUS when it seems like everyone is passing you. And yet when I run too fast for my own body, I struggle, and that just doesn’t feel good. It was a beautiful run along the water and past some cute shops and cafes. The weather was pretty much perfect, maybe in the 50s, not too hot or cold, and it didn’t rain as threatened. So it was pretty much an awesome run. But on the way back, the runners were so spread out, I couldn’t see the group ahead of me. I ended up getting a little lost (and taking a few people with me: SORRY!) and doing an extra half-mile or so. 5k Finishers! Yahoooo! Love the tutus. 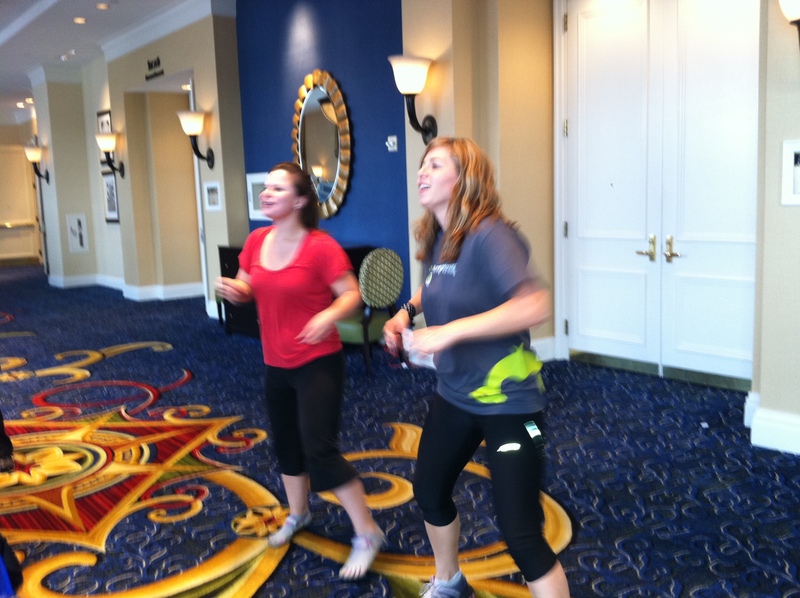 This rockstar @dubyawife ran her first 5k at Fitbloggin! As did several others. 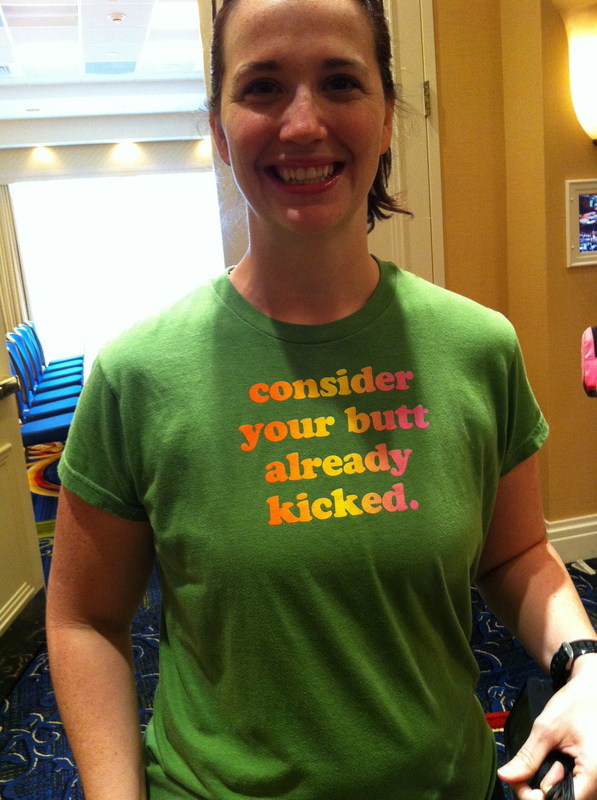 The sponsors at Fitbloggin were absolutely awesome. From the swag to the events to the meals to the giveaways, it was just so well supported. Yay sponsors! 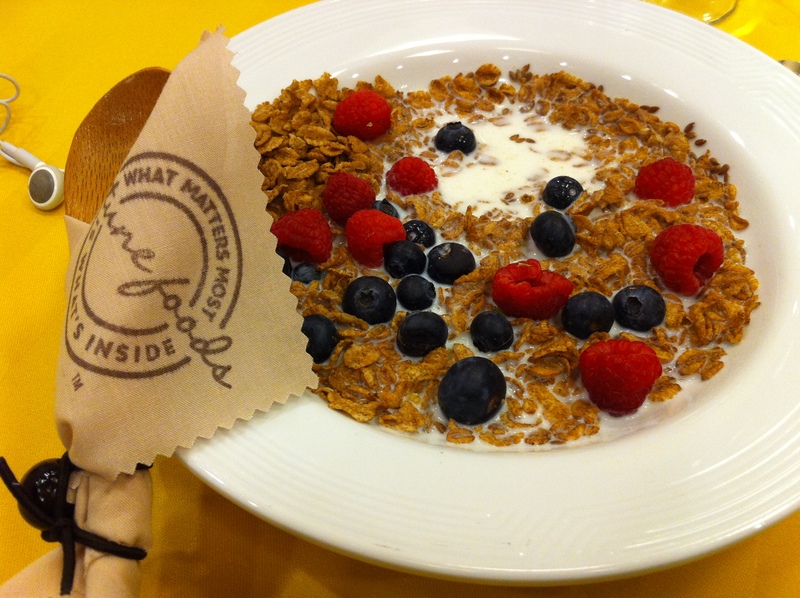 @Attune foods gave us a yummy breakfast and nutrition lecture. And a cute bamboo spoon! 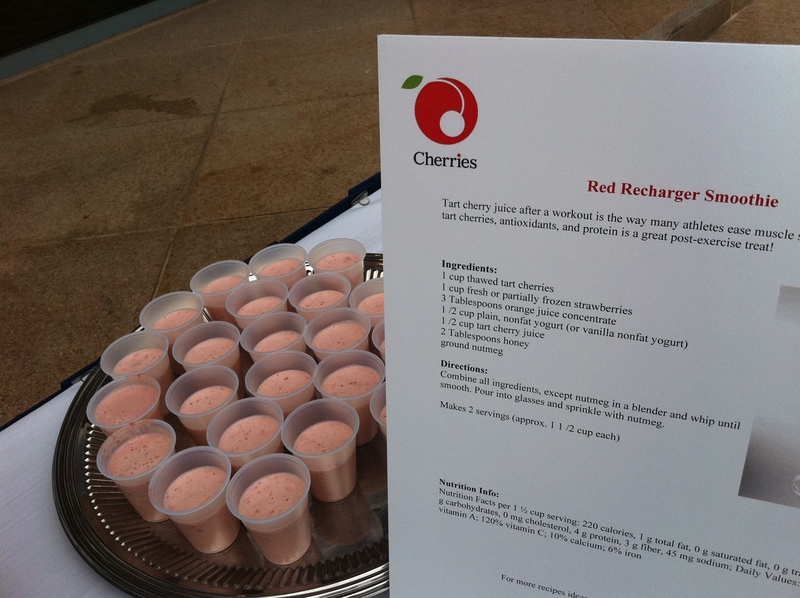 yummy cherry smoothies from the Cherry folks! After breakfast there commenced a huge number of other fitness sessions, none of which I wanted to miss! But I was sweaty. And shivery from the air conditioning on top of cold sweat. And TIRED! But as I said, I wanted to miss nothing. 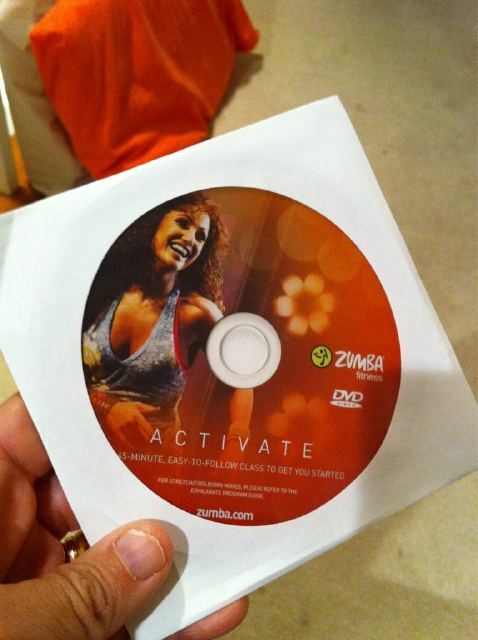 Except the Zumba. 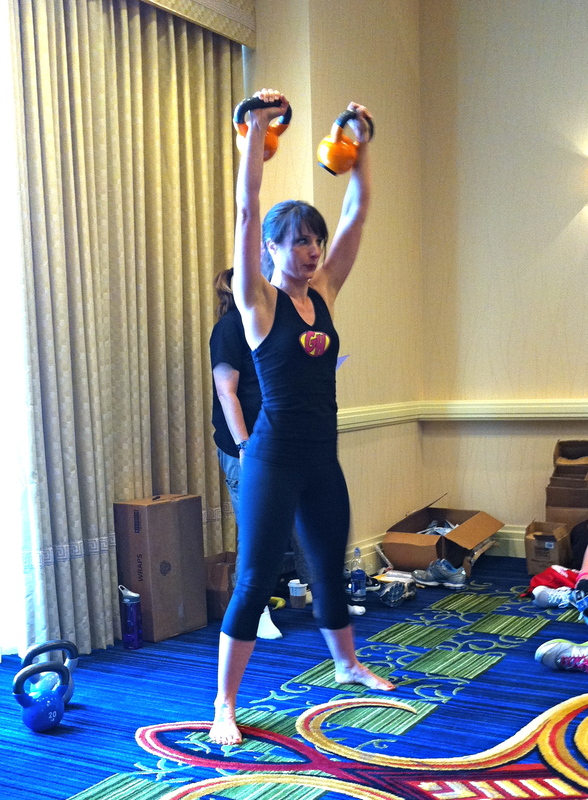 There was an awesome kettlebell demonstration by my roommate Karen, @fitmommy and @girl-heroes. WOW they knew how to swing those things. I was inspired. The awesome thing is there was a drawing for an Ugi ball (NOT CHEAP!) and… I won! I won! I won!!!!! I can’t even describe how happy this made me. And… with that… I’m gonna have to take a break. Midmorning Friday! Oh man. I’ll be back. There’s so much more to talk about. But this little recap has taken the better part of 3 hours and I got much else to do this sunny Sunday. If you were at Fitbloggin, I know you have your own recaps but please feel free to chime in about ANY of these happenings! And if you weren’t there, ask questions. It was freaking awesome. Second Sock Syndrome – 13 Feb, a photo by flissy666 on Flickr. So I’ve been reading on blogs and Twitter about people getting cold feet about Fitbloggin – people thinking about not going, or deciding not to go, or feeling uber nervous about going. In spite of my INTENSE level of excitement, there’s a little-to-medium-sized part of me that is all freaking out inside. And not just because I’m performing on Friday night (to either a big room full of people, or a big room with like THREE people. Which is worse??). It’s hard to really put into words but I saw that Roni’s recent blog post (Roni is the founder/organizer/QUEEN of Fitbloggin’!) was called Self-Sabotage. This word resonated with me so deeply without even reading the post. I think there’s a teeny tiny bit of that going on. 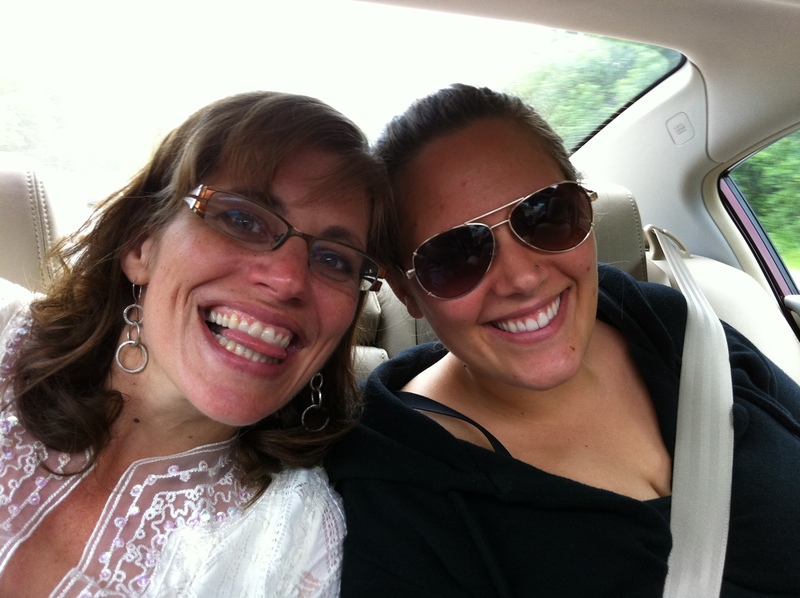 I was going gangbusters with the #30daychip a while back, diligently exercising Every! Single! Day! But then things took a little bit of a turn, and that diligence just turned to something else. Defiance? Laziness? Fear? I think maybe a bit of all those things. Someone Tweeted me this morning “I see you’re still awesome!” and I was like, um, I’m feeling sort of Awesome-Minus right now. Not at my very best. 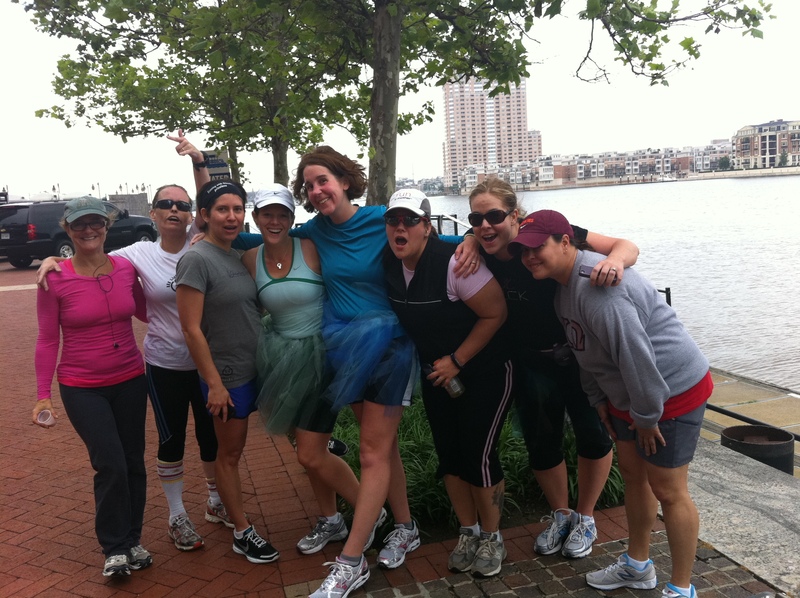 I think we all fear Showing Up at Fitbloggin’, when we’ve been sort of invisible to each other for all this time. Expectations are out there. People have a certain idea of who I am or might be. What if I’m a disappointment? What if, in spite of the Free Hugs campaign, people feel I am ignoring them? What if I don’t have enough TIME to talk and share and hang out with everyone I have wanted to for so long? What if… AGH! This is just the shadow speaking up, the little Gollum hiding underneath all the excitement and happiness. The voice needs to come out. But screw the cold feet. I’m gonna find myself some socks. 100th Bay to Breakers 2011, a set on Flickr. I did it! I ran in and finished the 100th Bay to Breakers today! As you know, I had a lot of conflict over whether I should even do this race or not. But after figuring out schedules, I realized it was possible to enjoy 24 hours at the spa and still do the race. Which is exactly what I did. Verrrrrrrrrry relaxing. I got home last night around 9pm and got my race pile together. While I was doing that, I realized to my dismay that I had left my sturdy ankle brace up at the spa hotel. ARGHHH. But then I remembered the nifty KTT tape I’d gotten at the Las Vegas marathon, and I whipped it out along with the instructional YouTube video on How to Tape An Ankle, and I figured it would have to do. I got up at 5:30 and my helpful spouse helped me tape up the ankle. Then I put on some compression socks, had my whole wheat English muffin with peanut butter (breakfast of champions) and headed out to the BART station. First thing I saw was this elderly gentleman with his race bib and a big cane. Which put a lump in my throat! The train was full of people with great costumes and a lively happy atmosphere. I did not wear a costume of any sort – not even my Totoro hat – because I thought it would be raining and I didn’t want to deal with a soggy costume. So I was just wearing my regular running stuff which felt pretty mundane. We all piled out at the Embarcadero and just followed the massive hordes of people going toward the corrals and the start. It was so so so so much fun seeing everyone’s costume. There were more tutus than you could shake a stick at (@Mizfitonline, you would’ve LOVED THIS EVENT). And a bunch of crazier things. I think my favorite was the Barrel of Monkeys. ADORABLE. For some reason, it’s tradition to start the Bay to Breakers by tossing thousands of tortillas in the air. I have no idea why, but the tortillas were definitely flying. Also big beach balls. Yeah, it was a party! It was fun inching up to the starting line with all the revelry. People were in very good moods. Finally we got to the start and it was different from any other race I’d been in because at least half the people there did not pick up speed at ALL after crossing the line – they just kept ambling on in relaxed fashion. But I think I’m conditioned to pick it up after my foot crosses that line so I did start jogging right away. It felt really good! I was just having a great time looking at everyone. I passed a bunch of blue Smurfs and some guys in bunny costumes passing out carrots. Huh? Cute, though. I did see quite a few naked people. How come the people who run naked have bodies that probably look a LOT BETTER in clothes?? LOL. There has been a lot of talk in B2B lore about the dreaded HAYES STREET HILL and when we turned onto Hayes I was like, OH NO! but truly it was not so bad. It isn’t as steep as the hill around the corner from my house. I decided I’d walk up it just to save some energy but I walked FAST and passed a bunch of people. It did seem like so many people were just… strolling. Which was fun. So the left half of the street was running and the right half was just out for a slow amble through San Francisco. Lots of people out on their steps and patios, partying it up and watching everyone. Many of them were also dressed up and that was fun too. Although I just read about some guy falling off his roof with “life-threatening-injuries.” Ugh. I actually have no sympathy for drunk people who get hurt doing stupid things. Sorry. Miles 2 and 3 went by pretty quickly. I was so jazzed to get to the top of the hill and then sort of fly down the other side. I was feeling very good around mile 3. Then when we started getting near the Golden Gate Park panhandle – mile 4ish – my left knee started talking to me. Then it started crying and I was like, WHAT? is this? It was unlike any other knee pain I’d ever had before – the back (posterior) part of my knee, right in the center. It sort of came and went over the next couple miles, and sometimes it felt worse to walk, sometimes it felt worse to run. I spent the second half of the race just trying to figure out a gait that was the most comfortable. In spite of the pain, I loved running through Golden Gate Park. I lived on the outskirts of the park for the first four years I lived in San Francisco, and I just adored that park. Especially the buffalo, which were right in my neighborhood. I got very emotional when we passed the buffalo. Man, do I love Golden Gate park. I was happy to pass the mile 6 and 7 markers, and then at some point I saw the ocean I knew that was it – the breakers in Bay to Breakers! Woo hoooo!!! I went through the finish line and then I really started feeling the daggers in my knee. I limped pretty much the rest of the way. We had to go another MILE to pick up our medals and food. I have to say, the post-race snacks were awesome: chocolate milk (post-race nutrition of champions! ), hummus and crackers, and Laughing Cow cheese. Which rocked. I had bought a ticket for a bus to go back to the starting line, and I was hobbling pretty much at that point. Another 3/4 mile to the bus pickup! OWWW! Got my medal. (yay!) Got on the bus (double yay!). Then I started feeling all sorts of post-race misery and general decomposition – upset stomach, chills and shakes, KNEE PAIN and overall fatigue. I dragged myself to the BART station and made my way home where I promptly took a very hot shower and passed out for a couple hours. In spite of the orthopedic mess, I am really glad I did it. It was super duper fun and just festive and great. I didn’t see people being rowdy or drunk, just having a great time. I’d say about HALF the people were walking and just having a good old time. It was fun to be in a race like that – unlike anything I’d ever experienced before. I want to do it again. And next year I’m definitely running in a costume! I saw lots of people wearing their pajamas which seemed very comfortable and easy. Next year: race in sushi pajamas! Yay! Now… I reallllllllllllly hope my knee is better by Friday for the Fitbloggin‘ 5k…. I earned that finisher's medal! 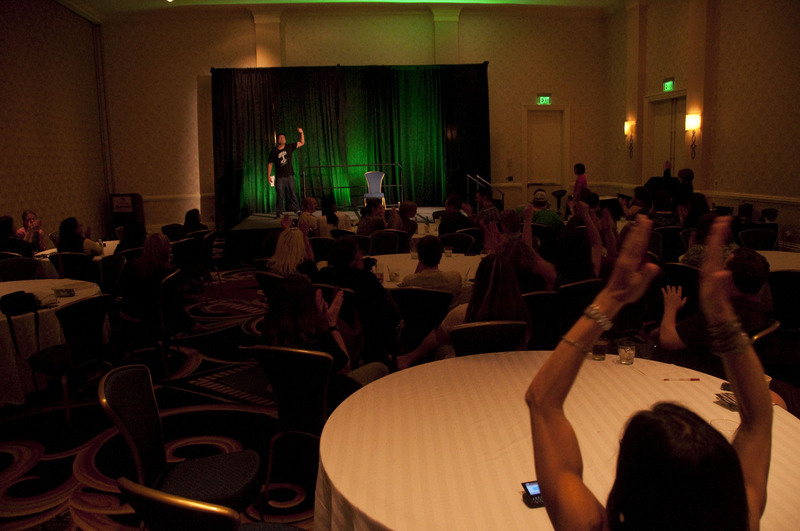 It’s hard to believe that after all this anticipation, I’ll be getting on a plane to go to Fitbloggin this Thursday! Squeeeeee!!!!! 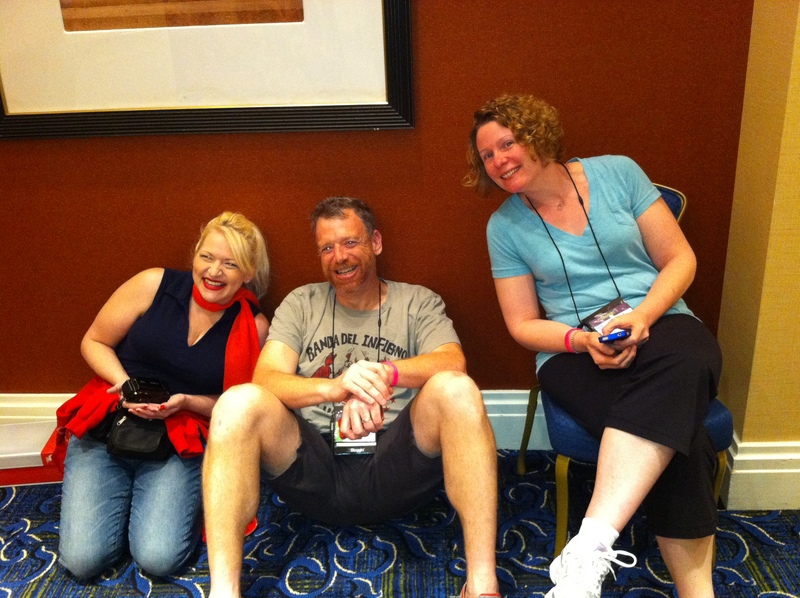 Last year at this time, I think I barely knew what Fitbloggin was. But what a difference a year makes. I’m so beyond excited. So I’ve met a few folks from my cyber community. But it will be nothing like the surreal experience of seeing hundreds of my “virtual” friends all together, IN PERSON, FACE TO FACE, in one place! 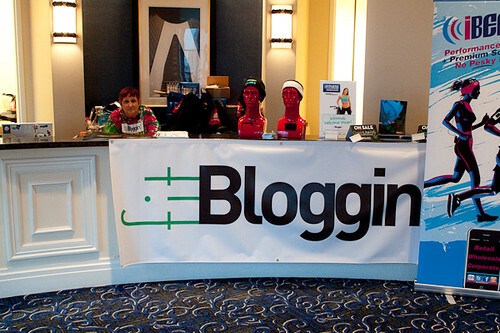 There will be 300 bloggers at Fitbloggin’ and I think it’s safe to say I’ve read the blogs of half of them, and been a mad raving FAN of dozens of them. I can’t believe I’m going to actually meet:…. err…. Okay, I was just going to list all the people I am excited to get to meet and realized it would take me ALL DAY to list them all with their links, so… suffice it so say, there are LOTS of them! So many that I can’t count them all and I fear my head is going to explode. At any rate, I am both thrilled out of my mind and jittery. Which is normal. We’re all jittery. But I’m ready. I have my business cards. I have my Totoro hat. I have my Free Hugs shirt and buttons. I have my hugging arms and my camera. One thing I know is that two days is going to be totally insufficient for all the meeting, greeting, sharing, hugging, laughing and sweating I intend to do (including the Fitbloggin 5k run! and stuff with Ugi balls and such!). Six months ago, I vowed to myself that I wanted to be in the Very Best Shape of my Life at Fitbloggin. Well, life had other plans and I am not exactly in the best shape of my life. I’m not in the worst either, but I’m not in any peak sort of form. But it’s okay. My arms are in fine shape for hugging, and that’s really all that matters, isn’t it? 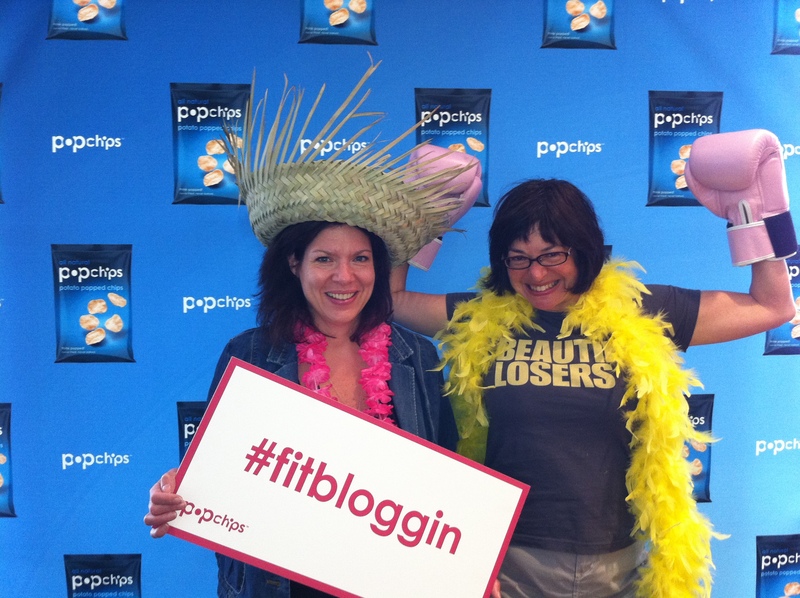 Comment here if you are going to Fitbloggin! Or if you went last year! Or if you’re not going but wish you were! 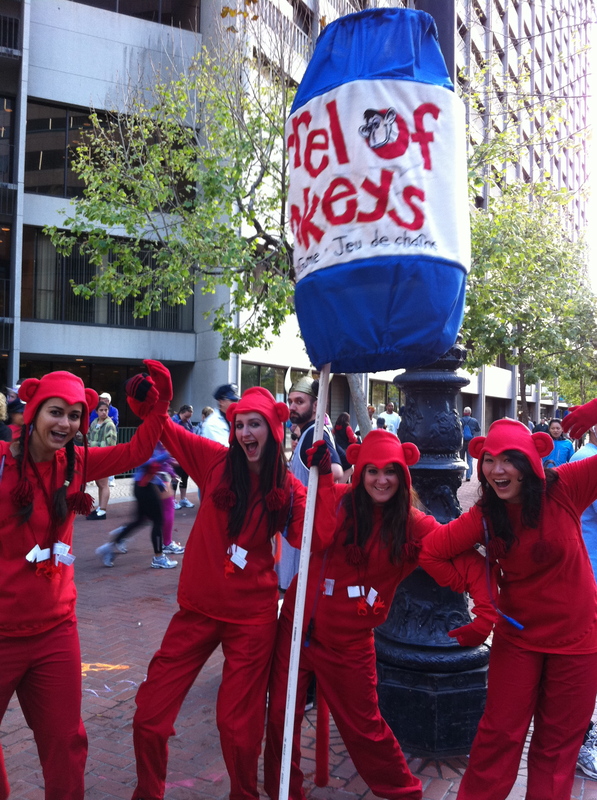 To Bay to Breakers Or Not To Bay to Breakers? That is the ? 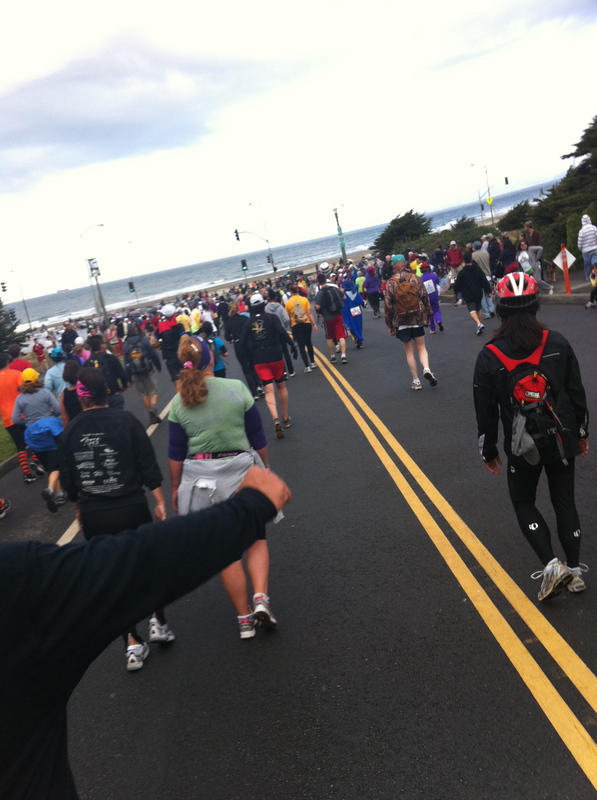 I’ve dreamed of running in the wacky, huge, only-in-San Francisco Bay to Breakers race ever since I moved here in 1982. And then for many years that dream receded into “Yeah, just like I’ll win the lottery”! unachievable fantasyland. But in recent years it’s seemed do-able. So this year I was very very excited to register for the 100th (!!!) Bay to Breakers race. Then my workplace scheduled its annual weekend spa retreat (seriously!!) on the SAME weekend. Yeah, one of the greatest perks of this job is the annual (paid) retreat to this very nice hot and cold springs spa. It’s NICE. Everyone goes and just has a great weekend. This was very disappointing, but the plan was that I would go up to the spa on Friday afternoon, then leave on Saturday evening so I could be home, get ready and race on Sunday morning. This was my plan until just this week when I began realizing that B2B is no 5k. It’s a 12k – over 7 miles – and I have NOT TRAINED. And there is very little time for me to do so between now and then. 2. I could just scrap it and stay with my family in Calistoga the whole weekend for some much needed soaking and R & R. Ahhhhhh. This decision is compounded by the fact that even though there will be hundreds of thousands of people, I am virtually doing this race alone. I know two people who are doing it, but we haven’t like formed a caterpillar or made up wacky customs or even made plans to meet up. I asked a ton of people to do it with me, but nobody else signed up. 😦 One of the funnest parts of B2B is doing it with a bunch of friends who all dress up (or run naked, heh) and that just won’t be my experience this year. SO. What should I do? 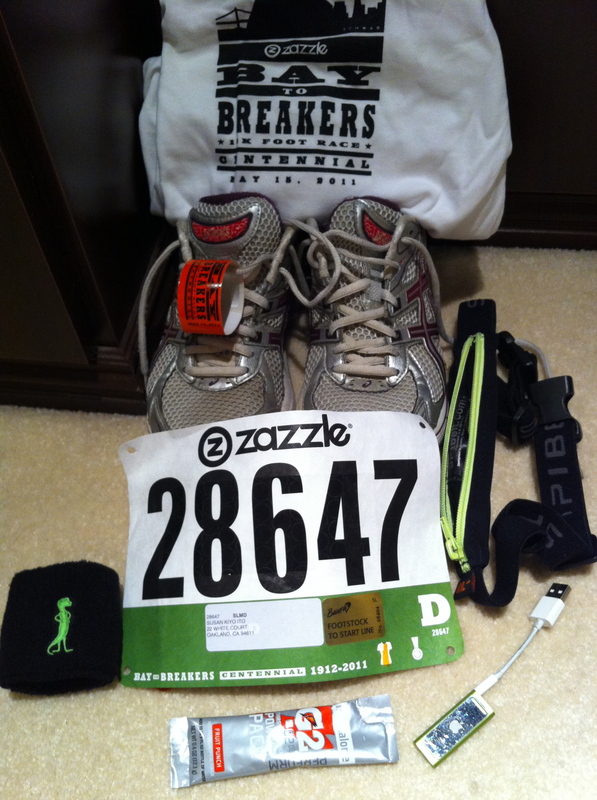 Part of me is/was so excited for this race, but I so freaking hate being unprepared. This process has been so interesting! Yes, the unofficial poll of comments here and on FB say that “spa!” is winning. So a few days ago, I decided I’d pass my race bib to my friend @Pubsgal. THEN I realized I had opted out of the mail-in race packet option, and I had to go to the race Expo to pick up my number. Well. THAT changed everything. Because as in “If You Give A Mouse A Cookie” and one thing leads to another, I know myself. I know that if I attend that expo, I am sure as heck want to do that race. The energy and buzz inside an expo is so exhilarating and it just gets me so pumped for a race. I love race expos! I think I went to the Las Vegas one like THREE TIMES before the half marathon. I also realized, if I go to the spa Friday afternoon, I can really have 24 full hours of R & R. It’s like having my cake and eating it too! So yesterday I thought I better go out and see if I can do the distance. I decided I’d try and do the 7 miles and see how it felt. After the first half mile of WALKING, my ankle was feeling truly jankety and unstable and I had funny little shooting pains. And I thought, “that’s it. NO RACE.” I felt sad but also that it was a clear answer. Wait a minute. One of my “running” songs came on my iPod and I gingerly starting running a bit. The pain went away. For real. My miles 2-5 were GREAT feeling. And then of course I was like, yeah! Bring it on! 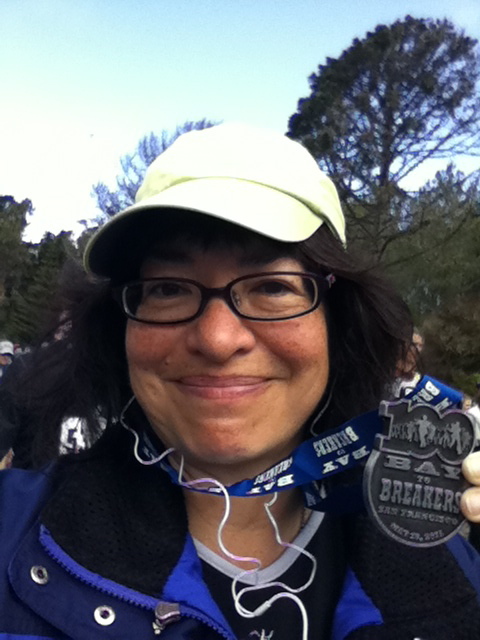 I’m doing Bay to Breakers! I had to end my run at 6.1 miles because Juniorette was finishing up her own (rowing) race at that moment and I wanted to be there at HER finish line. So I stopped. But was feeling just fine. So… as of right now…. it’s on, baby.